Christmas is around the corner! 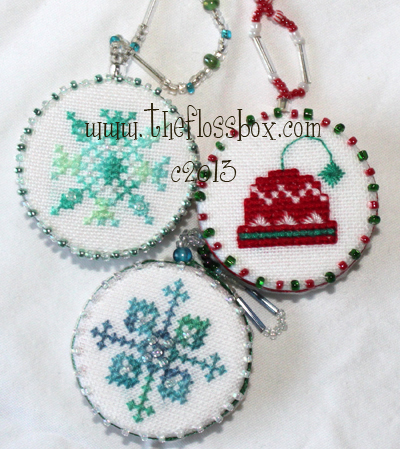 Here are some great ideas for making Christmas Ornaments using cross stitch. Please go to the source articles (links provided) for more great ideas! “Use plastic and metal bottle caps and jar lids to make these fun ornaments! Cut circles of the felt or flannel to fit the tops of the bottle caps and glue them on. 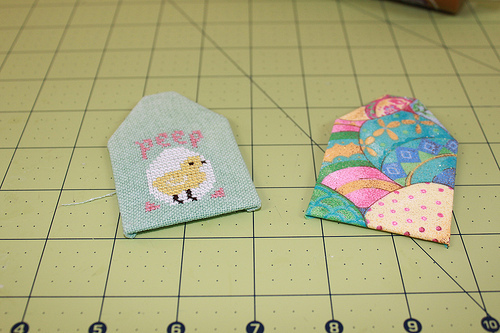 Cut the stitched pieces an inch or so beyond the size of the cap. Then do a running stitch about 1/8th of an inch from the edge. Put the cap inside the circle and pull the thread tight, center the stitching and tie a knot. To make the fabric tighter over the cap sew across the back of the fabric until the fabric is sewn in place. You can add a band around the cap, so the wrinkles in the fabric aren’t noticeable. Then sew on beads or add a little embroidery around the edge of the cap. *NOTE* Crop-O-Dile grommet setters are used for scrapbooking typically. STEP ONE: measure your stitched piece adding how ever much you want to the right/left and bottom sides (personally I add an extra 1/4 to 1/2 inch to these sides) add 1 inch to the top of the piece for the “tag” part. Cut out the appropriately sized piece of mat board X 2 for top and back. 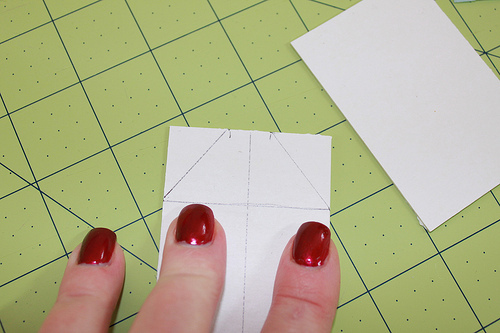 STEP FOUR: Cut off the corners following the cut lines drawn above and using this first shape as a template, line up the pieces and cut the other piece to the same shape as the first piece. 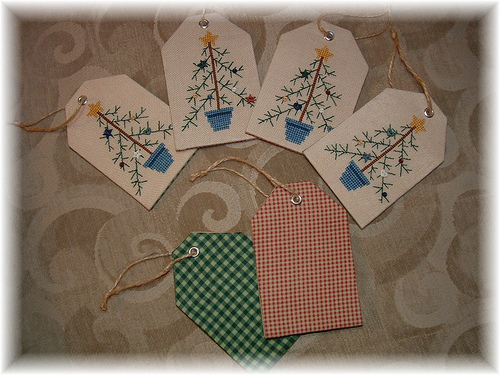 THEN, you have the front and back tag pieces! NOW, you have two tag pieces FRONT and BACK!